This unique series is specifically designed for young babies under 12 months of age. “Two-Tone Motion” features basic black and white objects, slowly floating against a simple, calm background. 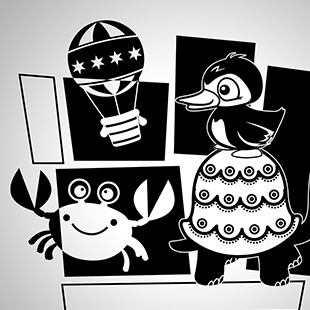 The contrast of the black and white colors allows babies to track the object with their eyes and learn to recognize the object. Set to the tune of sweet, soft classical songs, this provides families with a first-step developmental tool. See what time Two Tone Motion is playing!